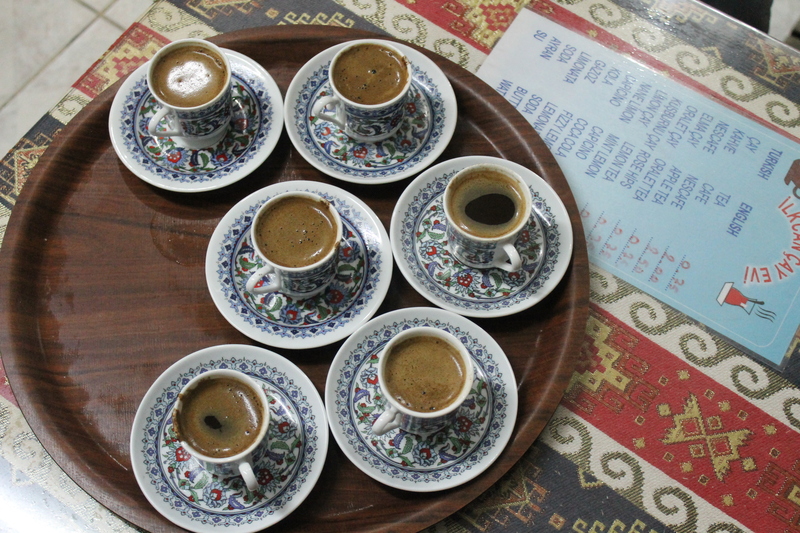 They say a cup of Turkish coffee is worth 40 years of friendship. 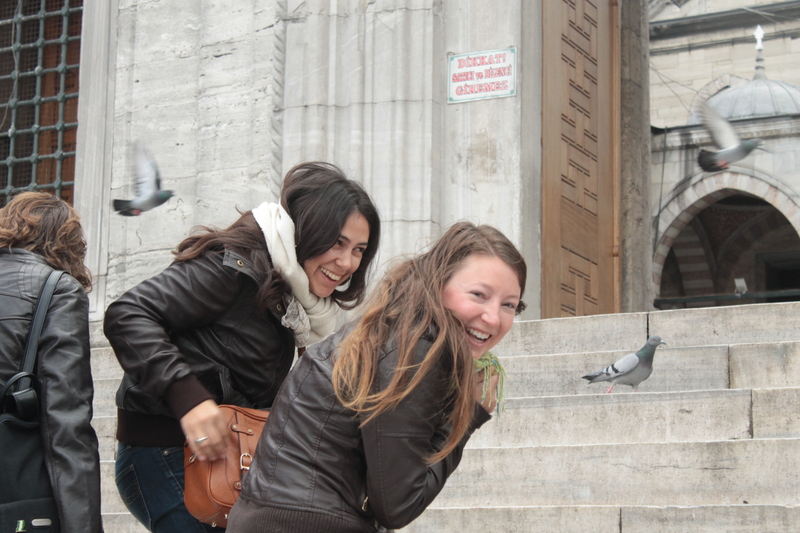 Between the seven of us, we barely had seven years of friendship, but we suddenly found ourselves in Istanbul, straddling two mighty continents and our own expectations for Turkey. We laughed, we scowled, we ate a lot of baklava. This is our Turkey Story. Our first day was rainy, so we spent the morning ducking in and out of mosques, listening to muezzin calls in stocking feet, relishing in feeling the carpet beneath them. After the trek downhill from Taksim and crossing the Galata Bridge, the two peninsulas that make up the European part of Istanbul, we found ourselves at the feet of the New Mosque. Our shoes came off, and the scarves went on. Wandering the back streets of the neighborhood, we ducked inside of a brightly lit coffee house and enjoying our first cup of Turkish java. The first sip was bitter, even while we stared out at a soft rain and men playing backgammon in stumpy stools. As the cups were drained, we looked for signs of the future in the grinds. No Hogwarts-like fortune telling here, though. 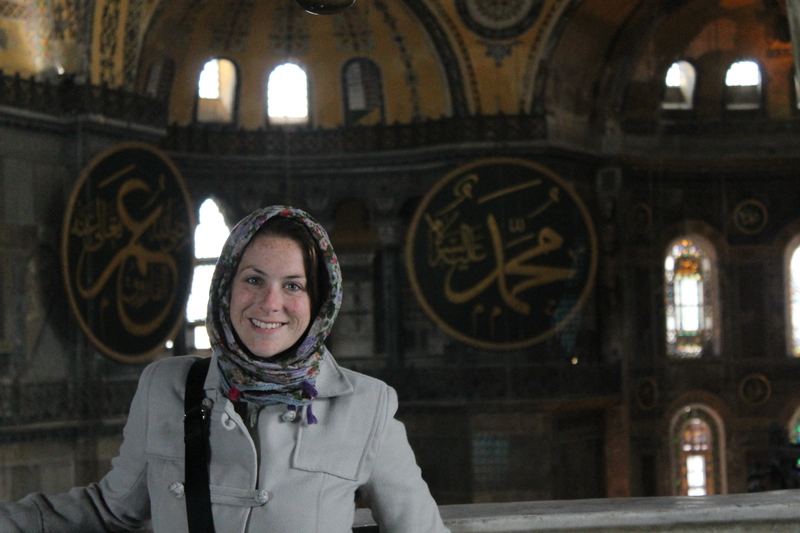 The Hagia Sofia, a momentous Byzantine structure marked as a “museum” left us in awe. Low-hanging chandeliers and larger-than-life mosaics and script adorned the cavernous space. Lunch was on everyone’s minds, so we hunted down a cheap chicken kebab and washed it down with freshly squeezed pomegranate juice. I remembered being warned about fresh juice in Morocco – the juice stung my gums and left my teeth purple, but I didn’t fall victim to bad water. The Blue Mosque was on the docket for the evening, and we traipsed through Sultanahmet Square as the wind howled. Just as we passed under the gate, the call to prayer began, and tourists were barred from entering. We were forced to contemplate its size and greyish hue from the outside. Truth be told, we were over mosques and all of that effort it took to take off our shoes, wrap our heads up, and then undo it all upon exiting. We decided baklava was a good alternative. The rain beat on, and Julie slipped into a bar. We ordered beers for us and one for Katerina, but our friends didn’t follow us in. when we left the bar, the waiter just replied, “There is the door, go away.” So much for Turkish hospitality. 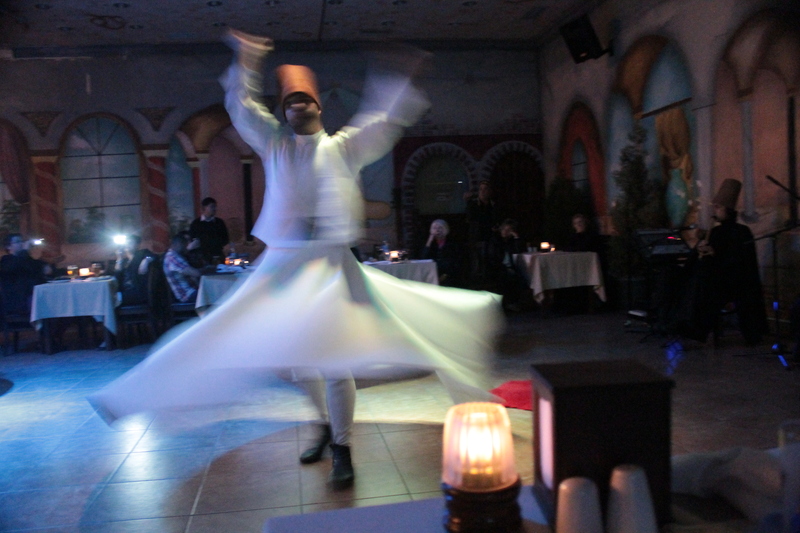 Since we’d pay for a dinner and music show at Agememnon’s (we think that’s what he wrote on the receipt…kind of), all of us chickens watched as the dervishes bowed before the altar and set to whirling around, soft-footed, as we ate our sausage kebabs. 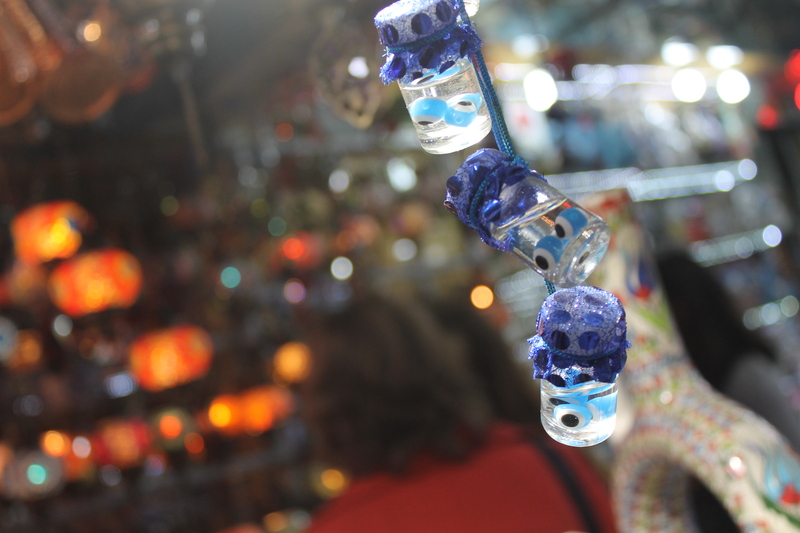 I was entranced and set my ISO to 3200, just to get the swirling effect. The next day awoke us, sunny and warmer, which was a treat after arriving to the hostel with wet boots and a broken umbrella. Craving a view of the Bosphorous and Marmara Sea, we paused at the Galata Tower, an ancient lighthouse and fire department building, to marvel in the boats zigzagging their way through the harbor and the sparkle of the sun on the river. Our attraction of the day center around the Topkapi palace, a fortified wall sitting on the end of the Eminönu peninsula. The imposing main gate, men dressed like old sultans and views of the channel were nice, but I left unimpressed and uninspired by the grounds and the prostitute bay, even after turning my camera’s color filter to bold. Our hungry bellies lead us to a kebab shop off of the main strip, where I was bursting to pee. We had our first lentil soup there, called çorba, which we ate with fluffy white bread. As we chowed down our kebabs, one of the girls with a headscarf at the table adjacent to ours leaned over and began talking to Katerina. I was on the other end of the table, so I ate happily, interrupted. When I asked the waiter where the toilet was (non-verbally of course, just be jumping around like a little kid about to pee his pants), he pulled me outside into a hallway and encouraged me to play a game of tag with him up the stairs, around a few corners and directly into a squatty potty. International toilets – 6 (China, of course); Cat – 0. As it turned out, she and the girl who accompanied her were executives at a publishing house, and they happened to be dining with an author whose books were being translated into English. She invited us to tea at their company office, a few doors down. Remembering a friend’s insistence that Islamic faithful are encouraged to share what they have, we had some tea with the girls, who rewarded us with free pins and books from the author. Outside, the day was quickly turning to night, so I suggested we visit a place a student’s mother had recommended to me. Lover of all things macabre, I’d been talking up the cemetery that had been converted into an outdoor garden to smoke water pipes and have a tea for the duration of the trip. Çorulu Ali Pasa was my favorite part of the trip. Through a narrow alleyway, we walked by stoves cooking hot coals in thin tin pots, and the men-to-woman-ratio was 10:1. Small groups of men sat on fraying woven blankets around pipes, with beautiful tiled lanterns overhead. It was twilight; the lanterns sparkled with the sun’s last daily effort as we ordered apple tea and a strawberry flavor for the pipe. I can’t say I’m a big shisha consumer, but we all relaxed as the men around us attended to businesses affairs or sat alone and smoked. 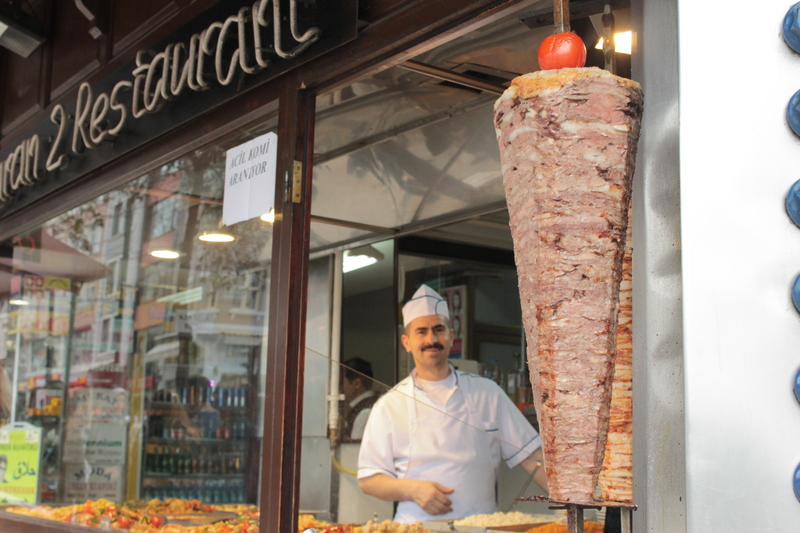 We retired to Taksim, nibbling at street food along the way. As we watched the sun cast an eery, moonlit glow on the mosque towers and Byzantine temples, I finally got the feeling: we were in an Islamic country. Only one thing left to do, then: head to Asia. 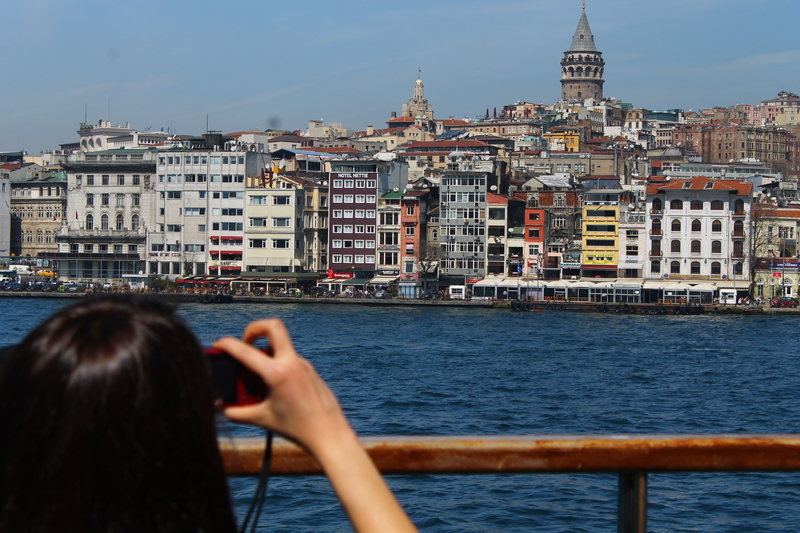 The following morning, which dawned bright and blue, we took a passenger ferry from the Eminönu side of the Galata Bridge to the Üsküdar neighborhood. The tokens cost a little under one euro, and the trip was barely ten minutes, and suddenly, we were traversing another continent. While the Asian side doesn’t have many monuments, the views of the Maiden Tower and business districts of the European peninsulas are breathtaking. We had tickets for the archaeological museum, thanks to our MUZE pass, so we spent hours traipsing through sarcophagi on the warm day and split off from Julie and Tilly, also making a stop off at the Basilica Cisterns, an overly touristic underground cave. There were even animatronics, if you can believe it. Our dinner was a quick cafeteria-like place, frequented by young students in the Taksim district and policemen. Live music pulsated in the nearby bars, but I found all of the walking and eating was slowly turning me into a sloth. We decided to ask the staff of our hostel (who spoke very little English) for some recommendations for hamams, the traditional Turkish baths, and found one right near our hostel. It would wait until after the Gran Bazaar, though. 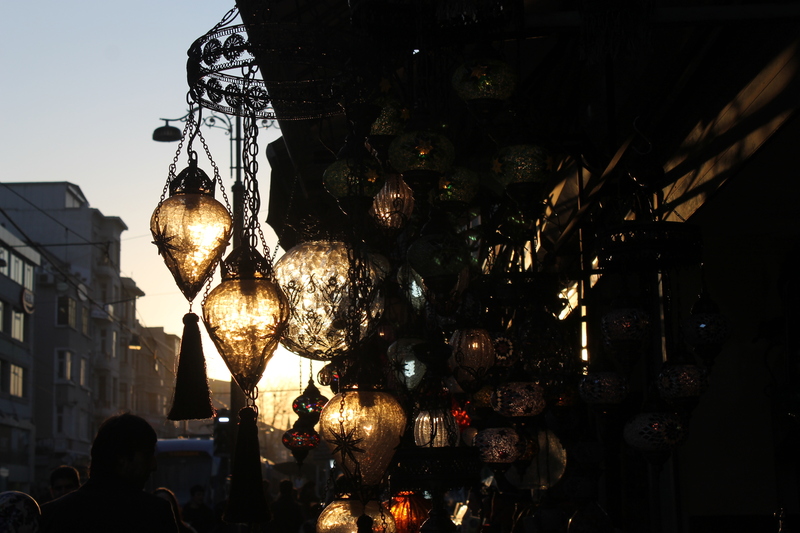 Though overly touristy, this enclosed maze of 61 streets is home to vendors of everything from Turkish football jerseys to pashminas to antiques. 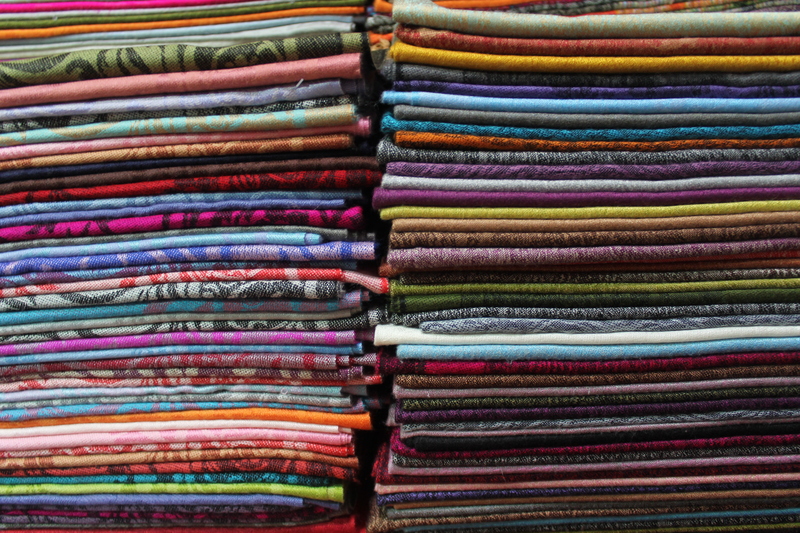 We split up to cover more ground and browse the stalls under arches painted in ochre, dandelion and celestial hues. 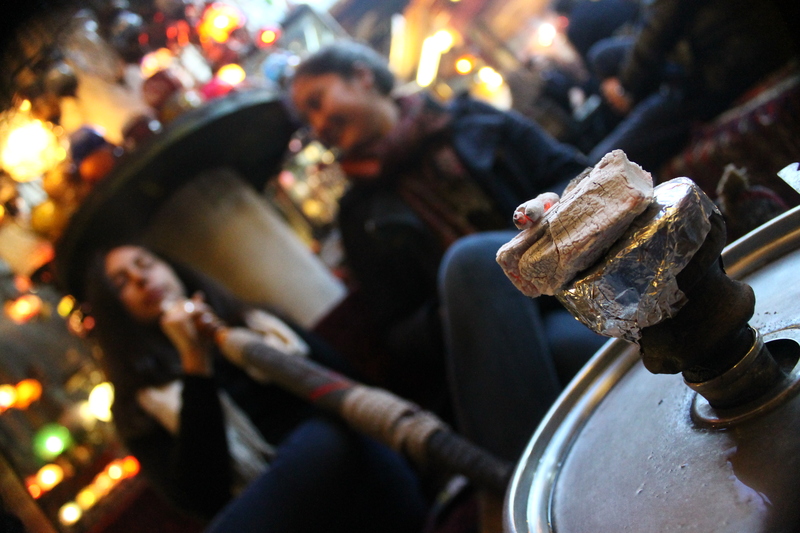 Fountains and tea stands punctuated every small street and the antique pipe vendors had hidden gems. But I had an agenda: evil eye jewelry, a few spice grinders and an engraved dagger for the Novio. After having bargained in China and Morocco, I knew the drill: start below the price you’re willing to pay. Listen to the vendor rant about feeding his children (I didn’t see a single woman selling). Raise your price by a few lira. Continue repeating this step until you think you’ve exhausted the topic. Try adding a few more lira to get two. If this doesn’t work, walk away until they call you back. Lie about another vendor offering it for a cheaper price, if necessary. In the end, I got three spice grinders for 5€ each, the dagger for 13€ instead of 20€ and two evil eye glass bracelets for 2€. Satisfied and exhausted, we awarded ourselves with MORE baklava in oozing pistachio and walnut varieties before finding the others. We had agreed to meet at the hostel at 5pm, but we were on the other side of time, so we took the tram. Being late in the day, our group got split up, so Kristen, Katerina and I had to wait on the platform for the others for six minutes. As the second train pulled into the station, we looked frantically for the other two when I was approached. Clutching my bag, I realized it was my friend from Sevilla, Alberto, also enjoying his Semana Santa. 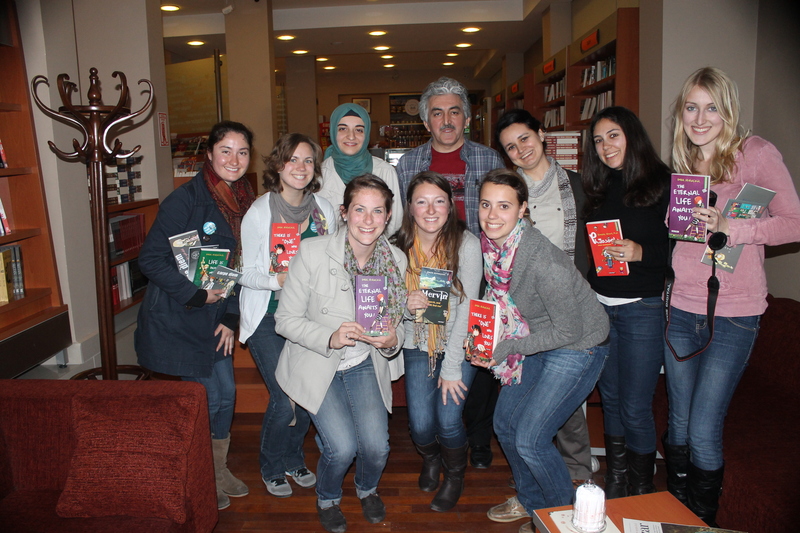 First my alumnos in Santiago, and now Alberto in one of the largest cities in Europe. Surprised as always, we caught up while the funicular climbed the steep hill, stopping to take picture proof in front of the square. 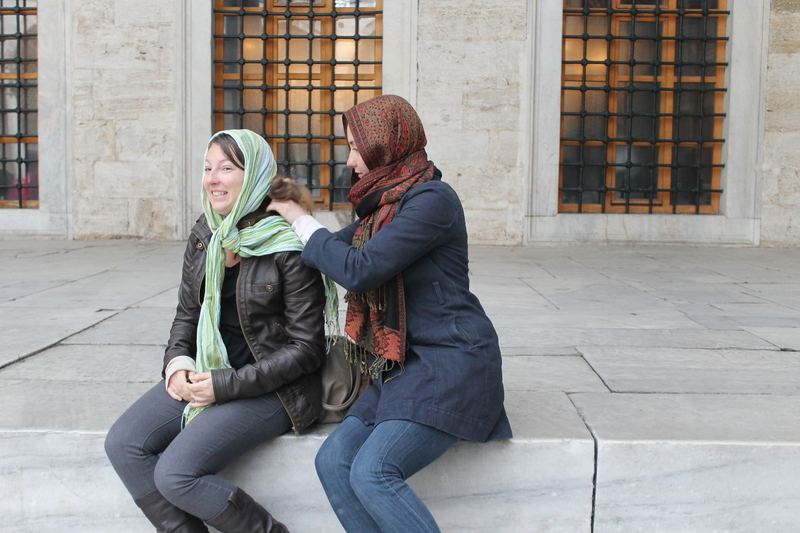 As we relaxed in the hamam (moe about THAT later), we knew our trip was coming to an end. 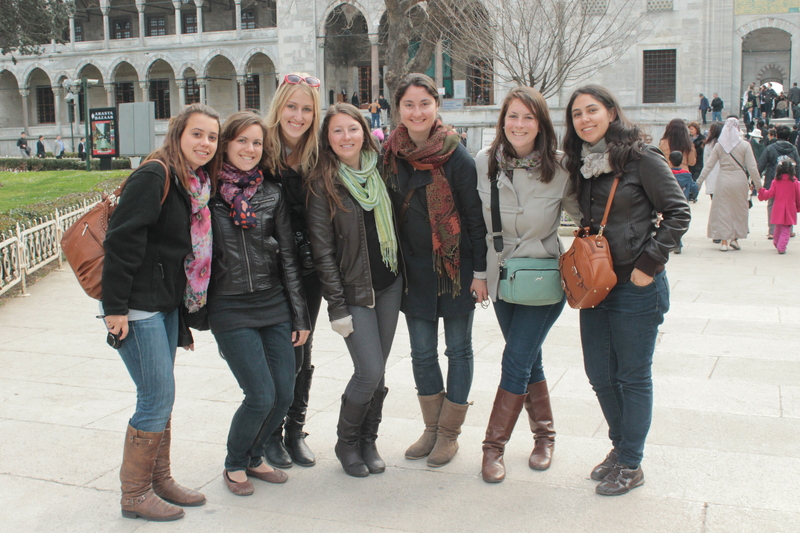 Tilly and Julie back to Coruña, Kristen to Málaga, me to Zaragoza and the other three to Sevilla for the Madrugá. 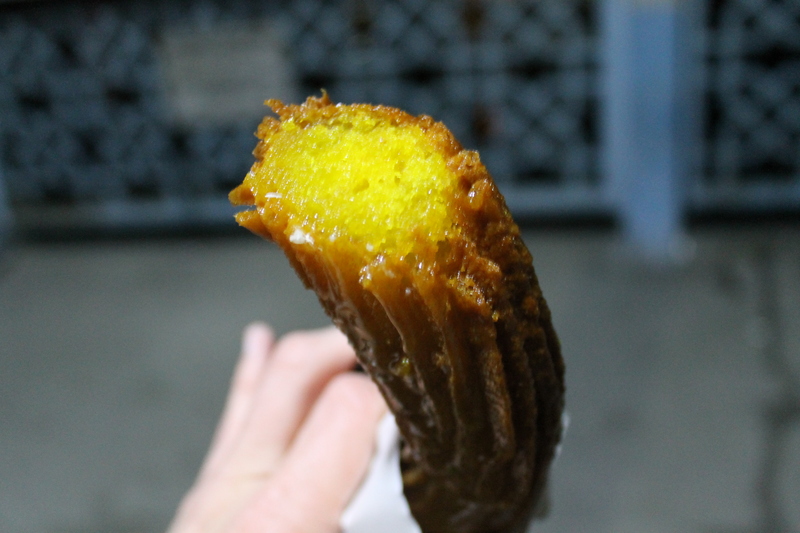 I thought back on all of the baklava, the people and the six towering spires of the Blue Mosque. 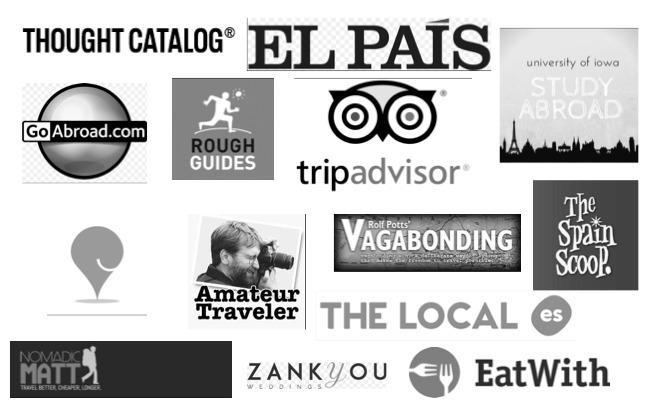 My four days in Zaragoza were certainly nothing to write home about (except to Ashlee, winner of my passport contest, obviously), but I was happy to have pushed my travel limits (hello, the toilets still get me!!) and finally see the last country on my must-see list. Have you been to Turkey? What did you like, or not? Favorite food? This is definitely a city I connected with and would love to travel back to! For great articles on the country, check out Hecktic Travels, as the Canadian pair is there house sitting and exploring beyond Istanbul. Sounds like an intense and fun experience. Would love, love, love to visit Turkey. I’ve been wanting to visit Turkey for the longest time! I know a woman who lived there for 7 years, and love hearing about her time there. The food looks delicious. The eye brings you luck!!! When I bought my dominos set at the Bazaar the vender asked me if I wanted to be more lucky in love or in money… I said love so he pinned it on the underneath of the left side of my jacket. 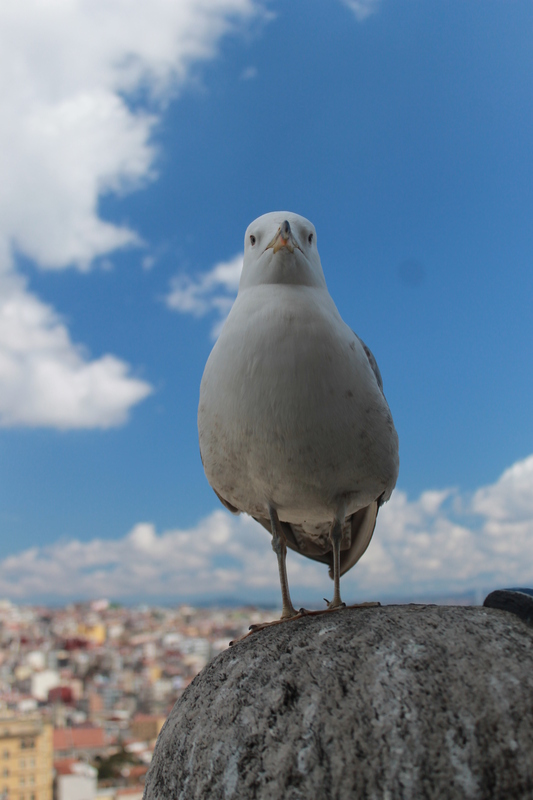 I asked a Turkish friend later and he said it’s what they tell the tourist…. But I’ll tell you… after over 4 years of being single, that next weekend I started dating my boyfriend and we’re celebrating our one year next week!!! What a great story!! And it’s been a year already?! Diossss. Did your kids read the nazareno article? Such awesome pictures, Cat! I love the one of the lanterns, the lighting is awesome. I really would love to go to Turkey in the future. I’m glad you had a good trip, barring the strange international toilets haha I got your postcard from Santiago, too, btw! Love it, thanks! You’ll be getting Turkey and Zaragoza soon, too! I sent them Saturday am. Looks & sounds like an amazing trip! I’d love to visit Turkey. My parents have traveled there and loved it. This is a really cool story and the pictures are really good (turkish coffee ; yum !, Gran Bazaar textiles : beautiful !). Thanks to all! It’s a really interesting and beautiful country, definetely worth a visit! I just LOVE baklava! Yet staring at how much calories it has I also may think twice about eating it, its my favorite thing in the world! Me and my family used to live in Uzbekistan, there were a lot of turkish people and therefore there were lots of turkish dishes… Loved turkish food, and miss it! Such a great trip! And I love how your photos turned out, especially the kebab one! Have you read the book The Historian? 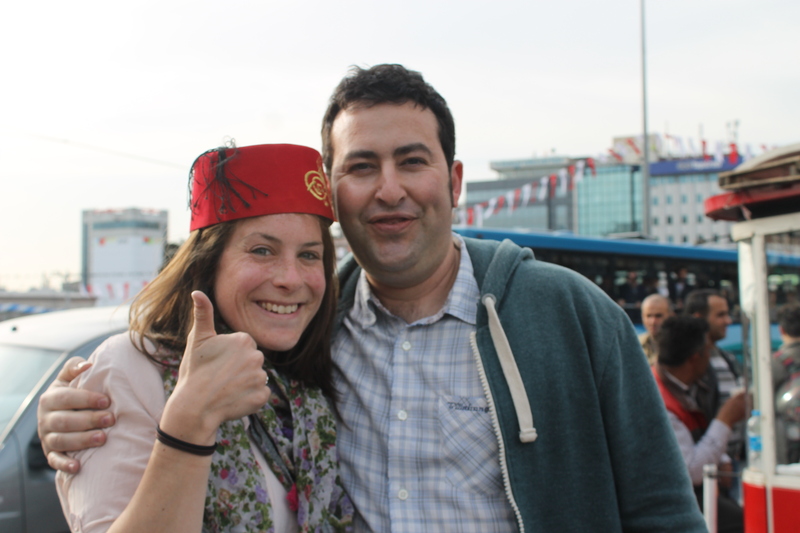 Mario didn’t like it, but I enjoyed it, and it made me want to visit Turkey so much! So does your blog post of course. I loved this post. Love Turkey and have visited several times. My brother and sister-in-law are moving there this next year so another visit will be in order. What an amazing job you did with these pictures and the writing – thanks for a great post. Thanks, Marilyn! Have got a few more to get to writing, too. I felt really inspired! Thansk, everyone, for such positive feedback on the story! As Kirstie says, it was a great trip and easy to feel moved by what we saw and experienced.